Leprosy, a chronic systemic granulomatous disease caused by Mycobacterium leprae cated from India since 2005. It was possible due to the wide spread use of MDT (Multidrug Therapy). Currently the disease prevalence is 0.66 per 10,000 populations. But still a considerable number of new cases of leprosy are being detected every year in our country. Odisha is one of the states where this disease is still prevalent. The annual new case detection rate of leprosy for Odisha in 2017 was 22.13 per lakh population, which was only below that of Chhattisgarh and Dadra and Nagar Haveli. It is transmitted from person to person by aerosol. It can also spread through contact with ulcerated skin of bacteriologically positive cases of leprosy. Majority of the cases of leprosy can be diagnosed clinically by eliciting cardinal signs. However, few cases don’t manifest visible skin patches or nodules but may present with skin changes like redness, swelling and mild thickening of skin. Such cases with infiltration of the skin are generally multi-bacillary with positive skin smears. In these cases, skin slit smear helps in confirmation of diagnosis. Some of the cases of leprosy presents with thickening of peripheral nerves and with sensory and motor impairment along the course of the nerve. A 43 years old male, a native from Nayagarh district of Odisha, staying alone in an urban slum of Bhubaneswar for last 15 years whose family members were staying in their maternal village. The patient was a construction worker by profession, but was not working since the disease onset. 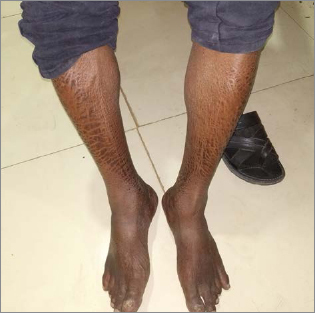 At the time of presentation to the primary health care centre, the patient had symptoms of multiple joints pain (ankle, wrist and knee), multiple infiltrative patches all over the body, ichthyotic patches over bilateral legs and ulcer over left lateral malleolus. On eliciting the history, the authors came to know that, the patient was a known case of Lepromatous leprosy and was on MDT for the last seven months. At the onset of the disease, the patient had nasal stuffiness for 2 months, epistaxis for one-month, bilateral knee, ankle and wrist joint pain for last 2-3 months. It was associated with intermittent fever. There was restricted movement of the joints with swelling. The patient had no known allergies and was not using any tobacco products or alcohol. For the first two months he did not seek healthcare, thinking of it as not serious. As the symptoms persisted, the patient went to a private medical college hospital in Bhubaneswar where slit skin smear was done. Slit skin smear for Acid fast bacilli was done from four different sites namely left ear lobe, right ear lobe, forehead and right elbow. Solid uniformly stained bacilli were seen in all the four sites and bacteriological grading was found to be 3+, i.e. averagely 1-10 bacilli were seen each oil-immersion field. The overall bacteriological index of the patient was also found to be 3+ from all sites collectively. Histopathology from the right elbow showed thinned out keratinised stratified squamous epithelium with underlying dermis, spindle shaped cells arranged in bundles and fascicles mainly surrounding the dermal appendages infiltrating the subcutaneous fat. These features were compatible with Histioid Hansen’s disease. The patient was conscious and oriented. His skin was found to be dry and sclerotic with decreased sweating. He had no dysphagia for solid and liquid foods. Local lymph nodes were not enlarged. The patient was found to have diffuse infiltration over back, face with shiny wrinkled skin and bilateral ear lobe infiltration. Eye brows and eye lashes of both sides were lost. An ill-defined erythematous patch was seen with shiny and wrinkled skin over right elbow with intact sensation. Ichthyotic skin was seen over bilateral lower extremities with pigmentation and shiny surface. On peripheral nerve examination, bilateral ulnar nerves, bilateral common peroneal nerves and bilateral posterior tibial nerve were thickened and tender. All other nerves were not thickened and non tender. Mild sensory loss was seen over the ichthyotic area, and there was no glove and stocking pattern of loss of sensation. An ulcer was seen over left lateral malleolus. The symptoms were in accordance with type II lepra reaction i.e. (ENL) Erythema Nodosum Leprosum. The possible differential diagnosis could be tuberculosis, streptococcal and viral infections, and sarcoidosis, but were ruled out as the lesions in these above conditions persist for more than seven days in these conditions, where as it doesn’t last for more than 2-3 days in ENL. The patient was on Multi-drug therapy with Dapsone, Clofazimine and Rifampicin. In view of the ENL, Methyl prednisolone was started and the dose was tapered over six month. But the inflammatory symptoms of ENL did not subside. In the subsequent visits the patient was prescribed Thalidomide. Paracetamol and Calcium were given for symptomatic management and Pantoprazole was given to the patient to reduce hyper-acidity due to the steroid therapy. Even after seven months of treatment, the inflammatory symptoms persisted. The patient was taking treatment for the first seven months from the private hospital. Then the patient consulted a dermatologist in a primary health centre. 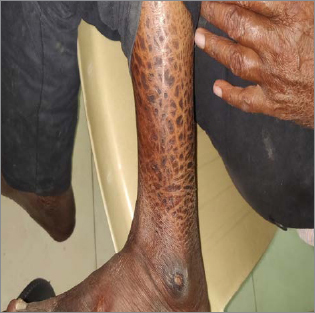 The patient then continued MDT under National Leprosy Eradication Programme (NLEP) and Prednisolone was started for ENL according to the treatment guidelines in the PHC. After a month of treatment with Prednisolone the inflammatory symptoms resolved and no more new erythematous patches developed. The further treatment plan included continuation of MDT and tapering the steroid therapy as per recommendations. If the symptoms would not relieve, steroid with Clofazimine could be considered for ENL. The patient was advised for self care to assess the sensory loss. ENL can occur before the start of treatment, during treatment, or after the treatment has been completed. It can be mild or severe. If the peripheral nerves or eyes are affected the reaction is considered to be serious. Lepra reactions are mostly diagnosed by clinical examination. Inflammatory changes in skin lesions or appearance of new lesions, patches or nodules with acute onset, can be considered as lepra reaction. In this case, the patient had nerve involvement, inflammatory changes in skin lesions and constitutional symptoms like fever and joint pain. MDT under NLEP is given free of cost. But this patient had to bear catastrophic expenditure for the treatment as he was taking treatment from the private hospital. The financial burden forced the patient to keep his family away from him in his native village. The patient’s compliance for the treatment and healthcare seeking was good, that was evident from the prescription. Drug intake could not be monitored as the patient was not registered under NLEP in the first eight month of the treatment. The patient should have been referred to the government facility for MDT by the treating doctor of the said Private Medical College instead of asking the poor patient to purchase medicines. The patient was also missed during the recent active case detection campaign of leprosy, which was on 2nd Oct 2018. This may be considered the failure of health system and the robustness of national programme like NLEP. Steroid therapy started for the treatment was not according to the dose recommended and the duration was also longer, which could have manifested as side effects like, gastric ulcer, secondary infections, fungal infections, osteoporosis, secondary cataract and moon face. Total duration of recommended steroid therapy is 12 weeks. This case was different from other published cases in terms of failure of the health system to provide affordable healthcare to the patient and the lower level of awareness on the part of the patient about the availability of government facilities and particularly of NLEP. Impact of leprosy at individual level has physical, psychological, social and economic effects. Financial assistance is only given to those with visible deformity and persons availing reconstructive surgery. No supports are provided to those who lose their wages and become economically handicapped. In this case, the patient had not been working for last nine months due to the disease and been economically handicapped. As the new cases of leprosy are deceasing and the person’s with disability are limited with complete MDT treatment, focus should be shifted to keep these patients in mainstream by empowering the patients. As the case load of leprosy is decreasing, the health system & the programme directed for the control/elimination/eradication of leprosy are becoming lax. Thus, many new cases are missed in the community. These cases may act as trigger for resurgence of the leprosy. So the government health care system should have robust technology for early detection and registration of the new cases under the national programme. NLEP annual report 2016 - 2017. Central Leprosy Division. Directorate General of Health Services. Ministry of Health and Family Welfare, GOI. 2017. National Leprosy Eradication Program Disability Prevention & Medical Rehabilitation Guidelines for Primary, Secondary and Tertiary Level Care. Central Leprosy Division. 2012. Sehgal V, Srivastava G, Singh N, Prasad P. Histoid leprosy: the impact of the entity on the postglobal leprosy elimination era. Int J Dermatol. 2009;48:603-10. NLEP: Sparsh Leprosy Elimination Campaign. Central Leprosy Division. Ministry of Health and Family Welfare. 2018. Guidelines for the Social & Economic Rehabilitation of People Affected by Leprosy. ILEP, London. 1999.